‘maybe,‘ and courage. A dire lack of even one of these takes the candidate out of the running.” I have noted that many nonprofits tend to hire internally. The candidate has a good mission focused record and the board often wants to avoid moving costs. The results: implementation of new ideas are modest and everybody is happy until the organization hits a road bump. 2. Specific skill related to the organizations. This often is a difficult issue for the nonprofit board to resolve. Does the new CEO have to have a background in the specific mission of the organization, or can the person the candidate have experience in the mission of another type of nonprofit? Can the person only have a business or professional background? How will the person relate to the fund raising demands of the organization? 3. Relationship building will be critical. Can the new CEO work effectively as a “scout” for all types of relationships (examples: funding, professional, public relations), which require the approval of the board? 4. Judgment: How will the CEO handle tradeoffs, especially those where… “factors are qualitative and subjective.” These decisions are crucial, especially for nonprofits having community of societal impact. In the nonprofit arena, there is great temptation to measure process rather than outcomes. 5. Perception & Cognition: “Does a candidate see what waits around the bend before others do? Powers of perception and the ability to connect diverse external forces are worth a lot of points,” irrespective whether the person is the CEO of a public or nonprofit organization. Any nonprofit board will face soul searching dilemmas in weighting these five factors. It is a board responsibility that should not be totally delegated to the search committee. Sources: Ram Charon, “Why boards fail to choose the right CEO,” CNN Money, August 8, 2012. Jerry Talley & Eugene Fram, “Using Imperfect metrics Well: Tracking Progress & Driving Change,” Leader to Leader Journal, Winter 2010, pp. 52-58. 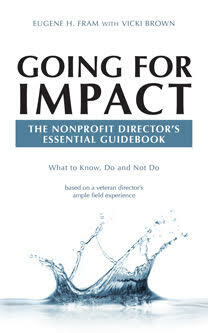 ← Is Your Nonprofit Chief Executive An Effective Fund Raiser? The one element not mentioned is: A predisposition and track record in Innovation.